Botgirl's Digital Playground: What Would McLuhan Think About Pseudonymity and Social Networks? What Would McLuhan Think About Pseudonymity and Social Networks? After a whirlwind week responding to the Google+ anti-pseudonymity policy through video and comic parodies, I rolled up my virtual sleeves over the weekend to give more serious thought to the related issues. 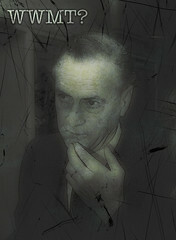 I ended up taking a shot at a Twitter micro-rant Sunday morning, asking myself, "What would Marshall McLuhan think?" It was a trick question. My purpose wasn't to extrapolate what McLuhan would actually have said if he had lived to see the age of the social network. The intention was to use the question as a jumping off point to create a series of probes, throw them into the conversational mix, and hopefully stimulate some fresh thinking. The social network is a shared virtual environment that is as psychologically immersive as a 3D virtual world. Social networks will eventually spawn new cultural forms, but we experience it today through a xenophobic small town mentality. We experience our social stream as personal space rather than shared commons. That's why we're so offended at unwanted intrusion. Some react to the pseudonymous in social networks as they would to masked, costumed people trying to interact in physical life. Given that we're all exploring a new social paradigm, it makes sense to give those who are pushing the boundaries a little slack. Pervasive immersion in the social network is deeply transforming our psyche in ways that are mostly invisible to us. Stay tuned! It takes disciplined emotional intelligence to take full responsibility for negative feelings we experience in social networks. Social networks can facilitate intolerance or reconciliation, suspicion or trust, trivia or wisdom. It's up to us. The mere integration of the pseudonymous into social networks assaults mainstream participants' mental models of personal identity... this is like someone turning up at a funeral dressed in yellow. It does challenge and therefore fear arises. One of the fears is "should I have dressed in yellow too?" another is that this yellow person is basically a revolutionary and not One Of Us.... but I'm sure there are plenty of others. Maybe at the root of all such fear of The Other is the fact that the mind (of the other person) is a black hole into which we could get sucked, thereby losing our "self". Hiro Protagonist/James Stallings here, to offer a critique of your blog post. I'd like to speak to the points you made directly, point for point, but before I do, I would like to say that overall, these are some pretty good observations, and a couple of them are really great. - The social network is a shared virtual environment that is as psychologically immersive as a 3D virtual world. - Social networks will eventually spawn new cultural forms, but we experience it today through a xenophobic small town mentality. after the comma: coming across as angry, and projecting on to others (whether or not it is your position that you are projecting). I'm anything but xenophobic. My business partner is in Australia, and many of my customers are scattered across the four corners of the earth. Sorry but the shoe doesn't fit. - We experience our social stream as personal space rather than shared commons. That's why we're so offended at unwanted intrusion. I think this is mostly true, but I think it is 'mostly' because we tend to use these networks in different ways. The 'clash' comes about when some of us using them one way come into contact with someone using them another way. To really complicate matters, none of us are robotic (I hope LOL) so we tend to mix up how we use the networks a LOT over the course of our usage. - Some react to the pseudonymous in social networks as they would to masked, costumed people trying to interact in physical life. Yes, because some of us (at certain times at least), see them that way. -Given that we're all exploring a new social paradigm, it makes sense to give those who are pushing the boundaries a little slack. This is debatable, but compassion alone would dictate that this is the case. This is why you (and several others) found your way back into my circles. It does, in fact do this. This is a brilliant observation, consider what it means, and realize that it is informed by some of these other things you and I have discussed. - Pervasive immersion in the social network is deeply transforming our psyche in ways that are mostly invisible to us. Stay tuned! Not so much as you might think. We're already all evolved to be part of social networks; we've just 'Hotted them up' (thanks Marshall). It is interesting that you should use the word 'invisible', though. That is a contributing factor to the stumbles we make online: We are only visible through our words. - It takes disciplined emotional intelligence to take full responsibility for negative feelings we experience in social networks. @james Thanks for your thoughtful comment. Unfortunately it got flagged as spam and I just noticed it and gave blogger my okay. I'll respond to the substance of your comment over the weekend, but I wanted to let you know I've read it and appreciate your feedback.